The Original Cool Vest – Gray Banox is made with extremely durable FR3 Flame Retardant Banox* fabric** and ideal for those who work in industries such as oil, gas and chemical—among others. The durable GlacierPack Protect set that’s included with this vest is what helps keep you cool. Made from stretchable specialty film, this cooling pack is extremely tough. *Banox fabric is a registered trademark of ITEX, Inc., used with permission. **NOTE: the Banox fabric is flame retardant, the cooling packs are not. There are those that work in hot environments. Then there are those who work where sparks fly or fire is present. The Original Cool Vest – Gray Banox with FR3 Flame Retardant Banox fabric is for them. The durable Banox fabric of the Original Cool Vest works to protect the outside of the vest from sparks while the GlacierPacks keep you cool and comfortable on the inside. 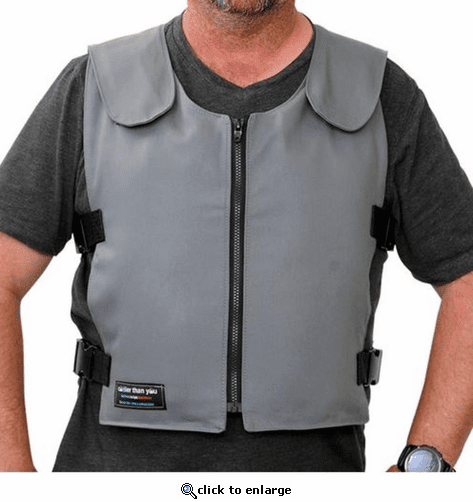 This cooling vest features adjustable quick release buckles and over-the-shoulder adjustability to fit a wide range of body sizes. Additionally, it includes a heavy duty front zipper for easy on/off wear. NOTE: Banox is a trademark of ITEX Corporation for their flame retardant fabric that meets NFPA70E Category 2. The Original Cool Vest – Gray Banox with FR3 Flame Retardant Banox fabric is not tested or claimed to meet the standard as an assembly. No model of Glacier Tek Cool Vests should be worn as an outer garment in any environment that will expose the wearer to arc flash or open flames.